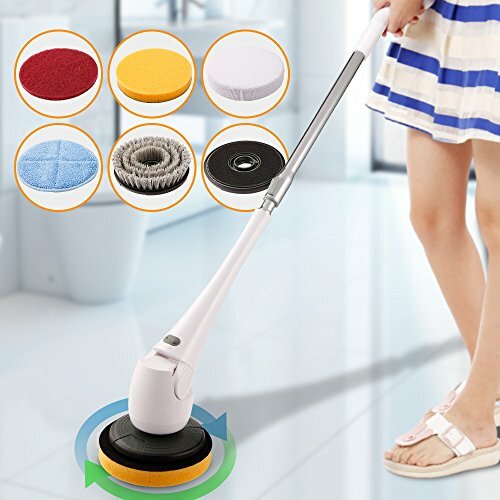 COOCHEER Functional Powerful Scrubber adpote the newest cordless power cleaning machine with telescoping disassembly and IPX7 waterproof technology. To be able to stand the entire time you're cleaning your tub, shower, toilet, sinks, plus have the attachments to get under narrow rims and corners has been a lifesaver. This Electric Spin Scrubber will Cut through soap scum and mildew with the brilliant work of the cordless and flexible Hurricane Spin Scrubber, it will be your household cleaning helper for years to come. Hard short brush: Used for cleaning the hard tile floor, swimming pool, bathroom. Long bristle brush: Used for toilet bowl, car wheels, door gaps. Cotton flannel pad: Used for flat bathroom, tub, tile, wall. Scouring pad: Used for the hardwood floor, Dressing tables or kitchen OIL STAIN. Sponge brush: Mainly clean the window glass, car window, and mirror. Extension wand - lets you clean all those low or high places. NO Bending,NO Hard Work--To be able to stand the entire time you're cleaning your tub, shower, toilet, sinks, plus have the attachments to get under narrow rims and corners has been a lifesaver. Waterproof Rotating Head--The water-proof seal design makes it safe to operate under wet conditions such as showers, tubs, sinks, etc. 90° rotatable spin head to clean any places of the corner. Telescoping Extension Handle--Telescoping pole handle extends from 29.5 to 55 inches in length,making it possible for you to finally reach every inch of your shower.Telescopic tube with collecting base, easy to use, easy to maintance. Cordless Rechargeable Power Scrubber--The Tile Power Scrubber is powered by a 10.8-volt rechargeable Li-ion battery,runs up to 2 hours long on a full charge which facilitates cleaning around the home and outside.